When it comes to travelling, there are plenty of luggage options out there. From expensive brands to everyday totes, the options can be overwhelming. Ultimately, a person must choose what they like the best and what works for them. However, you may not know that Billabong not only has comfortable clothing but luggage as well. If you’re looking at some inexpensive travel solutions, this may be an option to pursue for style and lightweight durability. Duffle bags are some of the most versatile travel bags you can get. They are usually lightweight and extremely durable. The soft sides make them easy to pack and with zippers that stretch the entire length of the bag, everything you pack is easily accessible. The Billabong Transit Duffle Bag has twin webbed handles making it easy to carry. The base is reinforced to give it extra durability, and the strap is removable if you prefer to only use the handles. The bright blue zipper is a nice accented touch. Backpacks are also fantastic travel solutions because of their versatility. They have numerous pockets to hold everything you need and make it easily accessible later. For someone who travels a lot, needs a convenient carry on item, or likes an action-packed adventure, backpacks are the perfect travel bag. The Command Lite Backpack is lightweight but durable. It’s a medium-sized backpack at an affordable price with a large main compartment, mesh side compartments, and padded laptop sleeve. It has padded, adjustable straps and a mesh back for increased comfort and ventilation. 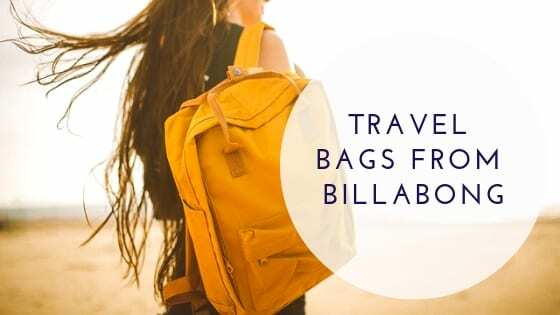 Billabong also offers the same durability and convenience of other travel bags like messenger bags, tote bags, weekenders, stashies, and beach bags. Enjoy easy, lightweight, and affordable travel solutions from Billabong for all of your adventures.